People who have diabetes should not wear slippers or sandals. The mission is one of the initiatives being undertaken by the Foundation, established in 2005 to continue the work of the late Patricia Ann Douglas, the best friend of Lee-Wilkins and the former principal of the St.Josephâs Convent Marriaqua. On Tuesday, March 22, SEARCHLIGHT visited the Levi Latham Health Centre, at Mesopotamia, where the six member team was seeing patients. Lee-Wilkins, a Nurse Manager at The Johns Hopkins Hospital, also advised that diabetics should wear whole shoes. She added it should be comfortable and not tight. Lee-Wilkins explained that diabetics suffer from poor circulation and as a result they should wear proper shoes. Explaining the importance of foot care in diabetic patients, Lee-Wilkins said diabetics suffer from diabetic neuropathy, which causes loss of sensation or feelings in the foot. âWhy is it so important? Someone who has diabetes, that has neuropathy, if he or she stumps or a nail sticks them, they are unable to feel. That can develop into a serious infection, and as a result of that, the infection can cause amputation,â said Lee-Wilkins. She advised that daily foot examination is critical, preferably after a shower. If a problem is identified early, an individual can save a limb, said Lee-Wilkins. She noted that there are many actions that one can take such as calling their private doctor, attending a clinic or alerting someone in the medical field. Preventative medicine is the best, Lee-Wilkens said. 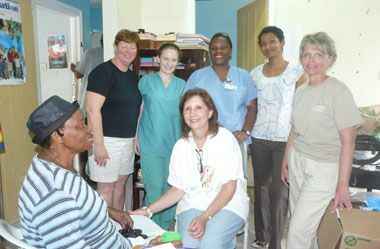 The team, which comprises Lee-Wilkins; Physiatrist Dr. Lauren Shapiro; Endocrinologist Dr. Anita Ramsetty (a native of St.Vincent and the Grenadines); Family Nurse Practitioner Darlene Fuchs-Lyons; Registered Nurse Pamela Spring, and the newest member Pam Mazzo, spent the week promoting diabetic foot assessment, with the goal of preventing amputations among diabetics in this country. Clinics were staged at the Georgetown Diabetes and Amputee Clinic on Monday, March 21; Mespo/Kingstown Diabetes and Amputee Clinic on Tuesday, March 22; Layou Diabetes and Amputee clinic, Wednesday, March 23; and Bequia Diabetes and Amputee Clinic on Thursday, March 24. Assessing the achievements of the Foundation, Lee-Wilkins said she is very pleased and the key achievement is giving back to St.Vincent and the Grenadines and other parts of the world. âI think we have begun to make strides and a difference. Additionally, the clinics have begun to implement the foot care assessment,â said Lee-Wilkins. Lee-Wilkins further stated: âYes, it was my goal to initiate the foundation, but again I canât work alone.â She said she is blessed to be collaborating with the Ministry of Health and her colleagues. Today, the team will hold a General Public Health Fair at the Peace Memorial Hall in collaboration with the Diabetes and Hypertension group. The mission team will depart St.Vincent and the Grenadines on March 26. The mission has donated A1C kits and other medical supplies to the Milton Cato Memorial Hospital (MCMH) and to the clinics. The foundation initially was established to give scholarships to empower underprivileged youths in St.Vincent and the Grenadines and Maryland, United States. However, it took on a second dimension in 2009 when Lee-Wilkins and her colleagues made their first missionary trip here and brought it under the auspices of the Patricia Ann Douglas Foundation. Lee-Wilkins recognized that diabetes had become a big problem here upon a visit to the state in 2006.